We had to find something really special to do with Stuart's mom while she was visiting us....so we took her to iFLY to try indoor skydiving! iFLY's amazing wind tunnel creates a cushion of air that lets you get the feeling of free fall without having to do something crazy like jump out of a perfectly good airplane! I won't try to explain all the geeky science behind it but you can check out their website to see how the technology works. Both of the kids wanted to add a "High Fly" experience to their flight so we paid just a little more for the experience and they got a special stamp on their hand to remind their instructor that they were extra crazy brave. 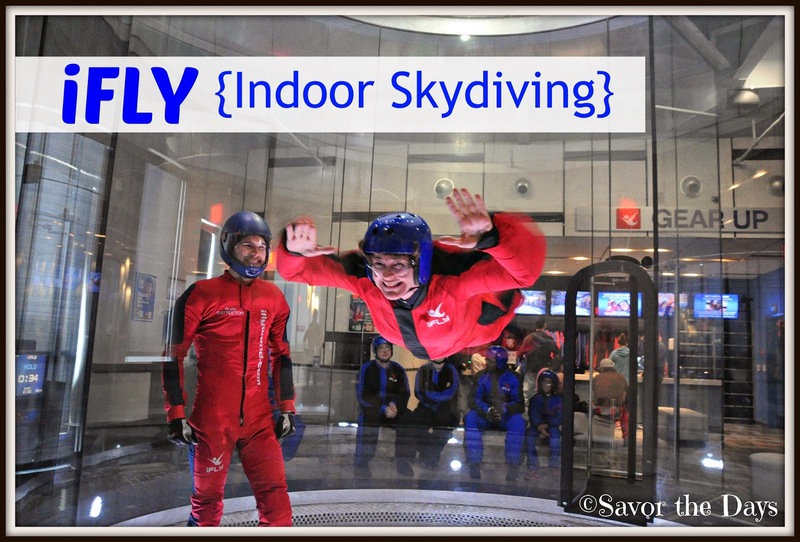 With the High Fly experience add-on, the instructor will fly with them up to the top of the wind tunnel and then float back down and they will do this several times together. We went through a training class. It was very straightforward and even Rachel who is only 6 years old got the most important lesson - the four hand signals that the instructor will give during the flight. He will motion to straighten your legs, bend your legs, lift your chin, and relax. Easy! iFly states that even children as young as 3 can fly. Everyone got geared up in their flight suits. Aren't they a cute bunch! Nicholas was excited and wanted to go first. He was a little wobbly at first. It is important to keep your body in the correct position and not kick your legs or flail your arms because it will make your body spin or fall when you may not want it to. But with a little practice Nicholas soon got the feel for it and he did great! He did even better on his second flight. He was flying pretty high! And on the second flight is when the instructor takes them on the "High Fly" where they go WAY, WAY, WAY up in the shaft! Oh my goodness! It looked like so much fun but my mommy instinct was still cringing for my little guy. Here's the video from his second flight! Doesn't it look amazingly fun!!! Rachel was next. She had good form in the beginning and showed us a few smiles. She's only 6 years old so she was really brave to even try this! I think she may have gotten scared when she flew a little higher but she did great. I'm so proud of her! Stuart's mom was third in our group. She is one adventurous lady! She did great and had a smile on her face the whole time! Here's her second flight video. Notice that as she enters, Dustin looks over at Stuart and asks him (through hand signals) if he should take her up on the High Fly! He shook his head no...but oh how funny of him to ask! That would have been quite a surprise! iFLY is a once in a lifetime experience....it is a little pricey so you might only be able to afford to do it once in your lifetime! But it would be a fun thing to add to your Bucket List. iFLY is located at 8380 Hwy 121 in Frisco. For more information, please call them at 214-618-iFLY or check out the iFLY website. You can also follow them on Facebook at iFLY Dallas.